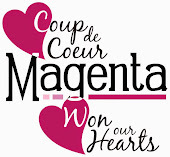 Hello Magenta Friends! With the weather here in Ontario starting to trend above zero, it is starting to truly feel like spring. Nothing heralds the season more than Easter with its iconic symbols of ducklings, chicks and bunnies. These little cuties bring smiles and new beginnings. Who can resist a cute bunny? I certainly can't and that was my inspiration for today's Easter card. I started this card by using Nuance powders to colour a piece of cardstock paper with Turquoise for the background, Yellow on the sunburst part of the Geometric stencil on cardstock and Grass Green on torn scrap pieces of watercolour paper. While the pieces were drying, I reverse stamped the Sketchy Bunny with Coffee Archival ink on watercolour paper, painted it, and fussy cut it out. Next, I used the interlinking circles stencil from the Background Trios Templates to add some interest to the Turquoise blue background by removing colour through the stencil with a baby wipe. Then, using the Vintage Letter stamp and Mustard Seed Distress ink, I added some subtle script text to the cut out sunshine ray. 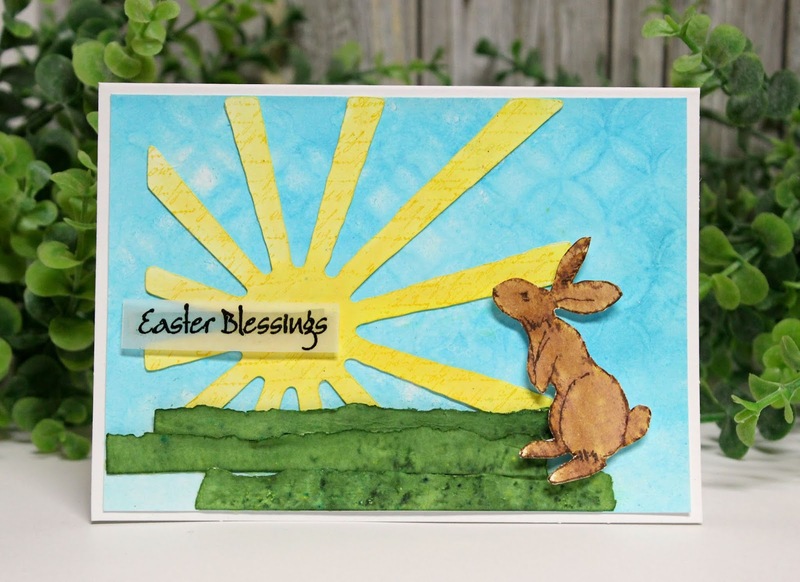 Lastly, I assembled all the pieces along with adding the Easter Blessing sentiment by black heat emboss stamping it on a strip of vellum.